Pete served five years in the Marines and currently continues to serve his community. He graduated from Western Washington University with a bachelor's in History with a focus on Greek and Roman history. Pete won his first fantasy football title with Daunte Culpepper and Fred Taylor. Unfortunately his last championship was with CJ2K and, one year, he was defeated by the tandem of Trent Richardson and CJ Spiller. Pete is a Western Washington University (Go Vikings! Undefeated at Football since 2009!) History grad with a doctorate in dynasty football, from a certificate he bought online. He prefers stats and analytics but realizes film grinding is an important part of the process. Dabbles in "Mild Takes" and believes in the process. Can Marquise Brown overcome his size and become a dynamic receiver in the NFL? We examine the speedster. He looks the part but his Scouting Combine performance was polarizing. What should we make of DK Metcalf? We continue our 20/20 series with more information on elusive running back David Montgomery. We continue our 20/20 series by covering another one of the draft's top receivers. 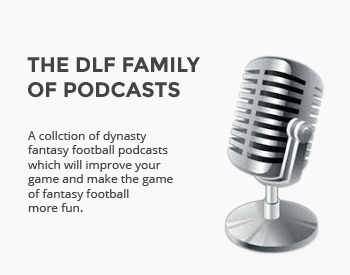 Just how valuable might N'Keal Harry be to your dynasty teams? We take a look at the big receiver. How can we explain Julio Jones' lack of touchdowns? We take a closer look. What can we expect from Houston's rookie wideout? We examine DaeSean Hamilton's dynasty worth in Denver. Can Brandon Marshall Take Flight in Seattle? What is the outlook for Brandon Marshall in Seattle? Can he get back to his productive ways? How high is the ceiling for Tampa Bay's new rookie runner? Could Sony Michel buck the trend and become a reliable weekly starter in the New England backfield? Can small-school back Chase Edmonds carve out a role in the NFL? We examine if he's worth a rookie draft pick. Miami's Mark Walton missed most of the 2017 season through injury. Is that causing him to be overlooked? 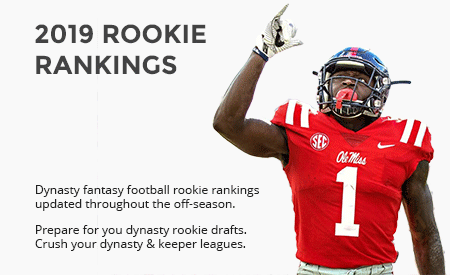 2019 Rookie Rankings ← New!